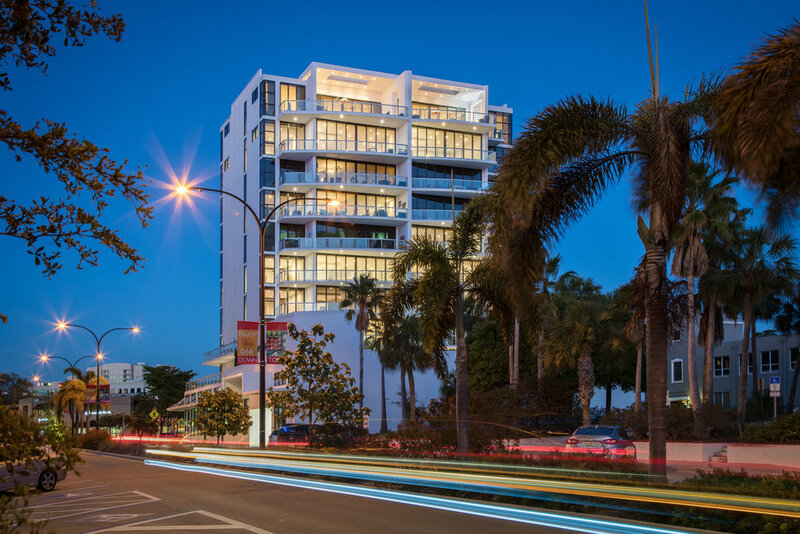 Sansara is a 10-story tower in Sarasota, Florida that features 17 unique residential units, a condominium amenity level, and ground-level interior parking. The building’s Zen-inspired architectural elements create a peaceful refuge within the vibrancy of city life. The Sansara residences include 16 half-floor units and a single full-floor penthouse. The penthouse connects a minimalist interior to an outside framed Zen garden which overlooks the Sarasota Bay. A raised pool/amenity deck – featuring a swimming pool, spa, cabanas, and a fitness center – provide an “urban oasis,” well above the busy intersection below. The common amenities utilize natural elements; including woods, bamboo, water features, natural stone, and a thoughtful selection of native plant species.